Additional remarks genetic modification The carbon catabolite repressor protein 4 (CCR4)-Not complex is a well-conserved, eukaryotic gene regulatory complex, broadly divided into two modules: CCR4 and CCR4-associated factor 1 (CAF1), regulating mRNA decay, and the Not proteins, regulating transcription and protein degradation. In yeast and other eukaryotes, CAF1 has a major role in determining transcript levels through regulated deadenylation of mRNA. Members of the CCR4-Not complex are well conserved in all Plasmodium species, suggestive of their significance in parasite gene regulation. The unsuccessful attempts to disrupt CAF1 indicates an essential role during asexual blood stage development of P. berghei. In P. falciparum a 'CAF1-knock out mutant' has been generated and selected by piggyBac-mediated mutagenesis. Asexaul blood stages of this mutant show a severely attenuated growth rate. Phenotype analyses of the P. falciparum mutant indicates that the average number of merozoites/schizont and the length of the cell cycle is similar to that of wild type parasites. However, merozoites show a defect in egress from the host erythrocyte. GAACTCGTACTCCTTGGTGACGGGTACCATTGGGGAACTTGTTCAC/CATCTACAAGCATCGTCGACCTCTCACTTTTTGCATACTACAC) or 5342/5343 (5'UTR in construct pL1585; GAACTCGTACTCCTTGGTGACGGGTACCTCCTTATGTAGCCATTGAC/CATCTACAAGCATCGTCGACCTCCCAAGCCATATATAATACCTG) and 4727/4675 (3'UTR both constructs; CCTTCAATTTCGGATCCACTAGTGTGGCTTGTGTTAAAGAC/AGGTTGGTCATTGACACTCAGCAGTACTGCCTCTTCCCATTATTCTG). The 5'UTR targeting region in pL1585 was moved approximately 800 bp downstream compared to construct pL1518, leaving 770 bp of the 5’ ORF intact. The primers 4726, 5343, and 4727 have 5'-terminal extensions homologous to the hdhfr selectable marker (SM) cassette. This cassette contains hdfr under the control of the ef1a promoter region and the 3' untranslated region (UTR) pbdhfr/ts and is obtained from plasmid pL0040 by digestion with restriction enzymes XhoI and NotI (pL0040 is available from The Leiden Malaria Research Group). Primers 4674, 5342, and 4675 have a 5'-terminal overhang with an anchor tag suitable for the second PCR. In the second PCR, the fragments were annealed to either side of the hdhfr selectable marker cassette with anchor tag primers 4661/4662 (GAACTCGTACTCCTTGGTGACG/AGGTTGGTCATTGACACTCAGC), resulting in the second PCR fragment with the expected size, i.e., 3.0 kb (1.6 kb of the selectable marker cassette plus two targeting fragments). To remove the anchor tag from the final DNA construct, the second PCR fragment was digested with Asp718 and ScaI. Both constructs were used in two transfection experiments each, resulting in four independent attempts to disrupt P. berghei cafI. Transfections were carried out in 3 different parasite lines. Construct pL1518 was transfected into P. berghei ANKA 1037m1f1mocl1 (RMgm-32) and P. berghei ANKA 676m1cl1. P. berghei ANKA 1037m1f1mocl1 (1037cl1; RMgm-32) is a reference ANKA mutant line which expresses GFP-luciferase under control of a schizont-specific promoter. This reference line does not contain a drug-selectable marker (PubMed: PMID: 20019192). 676m1cl1 (RMgm-29) is a reference ANKA mutant line which expresses GFP-luciferase under control of a constitutive promoter. This reference line does not contain a drug-selectable marker (PubMed: PMID: 16242190). 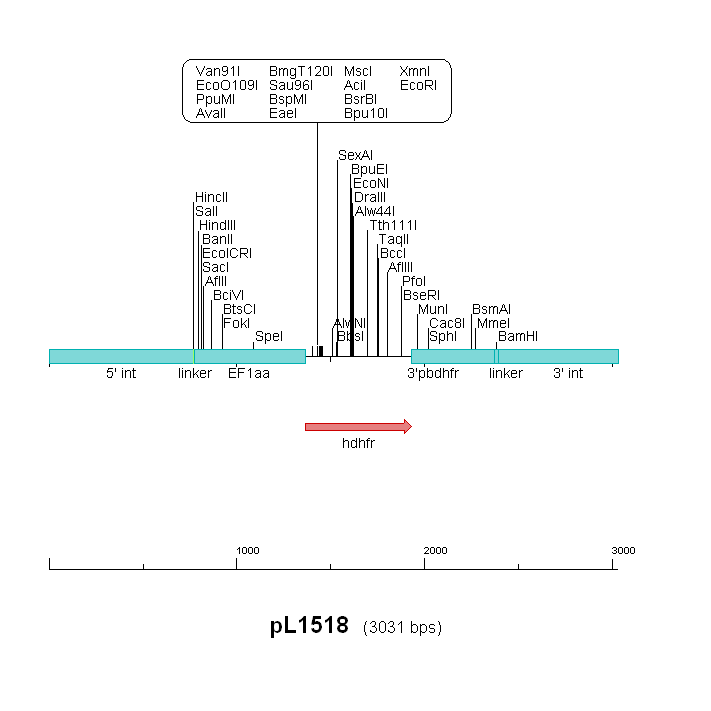 Construct pL1585 was transfected into P. berghei ANKA 1037m1f1mocl1 (RMgm-32) and P. berghei ANKA cl15cy1. P. berghei ANKA cl15cy1 is a reference wild type clone from the ANKA strain of P. berghei (PubMed: PMID: 17406255).